← 18. Speed limit? ……..What speed limit? I began to notice the countryside through the fine misty rain and started to enjoy being on the open road. What with leaving home at a sensible hour AND all the speeding I’d made good time so far but I knew it couldn’t last. Sure enough just a few miles from Darsham I came upon roadworks on a very small road and was held up for 20 minutes. After initially being very impatient with the delay I realised that I had time to spare anyway so what was I worrying about? Force of habit I guess. Traffic holdup = become stressed. I kept telling myself that there was absolutely no need to get upset but still it was hard to actually enjoy this part of the journey as the road was very narrow and enclosed on both sides by high, thick hedge so there was no view to admire – just the back of the car in front – and that wears thin after just a few seconds, never mind 20 minutes! I was due to meet Jason and Sue at lunch time in the car park of the Little Chef at Darsham and after eventually being allowed to continue my trip my spirits rose when I caught sight of their big camper van – a very welcome sight indeed. I pulled into the car park and after hugs and greetings all round we decided to drive out to the coast and have lunch at Southwold – which one of the guide books said was known as ‘Kensington-on-Sea’ – very grand. Southwold is a very attractive town on the coast and our first port of call was the functioning lighthouse. 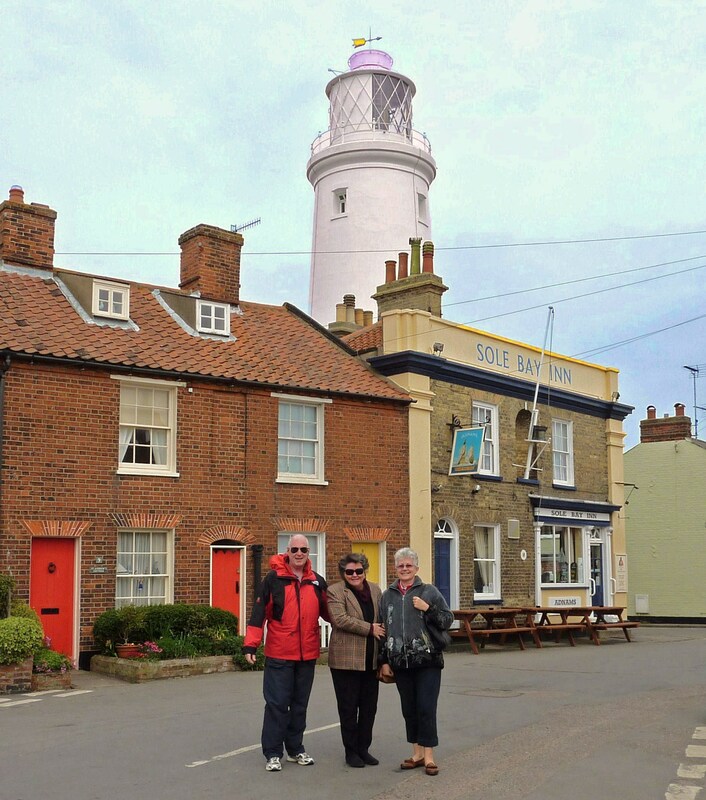 Now, when you get to Southwold don’t waste your time and energy looking for this lighthouse on some lonely, windswept outcrop in the harbour…….because it’s more or less in the main street! Honestly! I have photos to prove it. In fact this is where I started my photography in earnest and I’ll include lots of snaps from now on. Anyway… the lighthouse is smack in the middle of some terraced houses and the photos of it look a bit suss – as though someone had a few too many drinks then decided to have a bit of fun grafting the top half of a lighthouse to the bottom half of a suburban street scene. The resulting hybrid really does make you look twice. Bizarre but delightful……..and the bonus is that it still works after beginning operation in 1890. When I started my adventure in London that morning I realised this was my first day of bad weather since I arrived in England. Mind you, it wasn’t too bad on the drive. The day was cold and windy but when I reached the North Atlantic coast things were considerably worse. We parked next to the beach and had a very tasty lunch in the camper van as Jason and Sue had plenty of supplies in the fridge and we chewed and chatted happily as the force 9 gale buffeted the van giving us a feeling somewhat akin to lunching on a lurching train. It was amazingly cozy but we had to yell at one another occasionally for our conversation to be heard above the roaring of the wind. After a yummy lunch and a nice hot cuppa I simply HAD to brave the weather and get out and have a close look at the beach huts along the front. Wonderful little buildings, each separately owned and painted all colours of the rainbow they looked splendid lined up in a row beside the sea. The sight would have been even better on a sunny day, no doubt, but the beach huts stood bravely to attention in the face of the cold wind blowing in from the North Sea and the wild, choppy grey water they were overlooking on that particular day. I loved them! It’s always easy to tell how much I like something by checking out my photos. Er….this is a photo of the beach huts…er..Sue and the beach huts.. .er…Jason and the beach huts… er…Sue and Jason pointing at the beach huts…er..Mary and the beach huts… er…Sue, Jason and Mary and the beach huts…what! (there was obviously someone else brave enough to venture outside for their constitutional in this crazy weather).. er…beach huts from a distance..er…beach huts close up… er…oooo!… a lovely blue beach hut…and a pink one ….and a STRIPED one. Well I never! As I said – a stripey one! Thank God for modern technology because I’d never be able to afford the photo developing fees we used to pay in the old days. Although there are still a couple of ancient beach huts left mostly they were built in the 1960’s and you could land one for under £100. 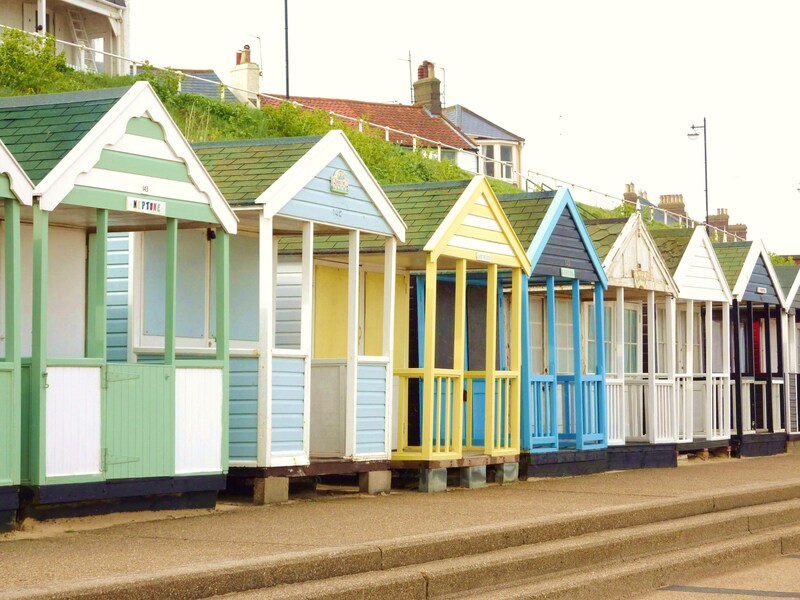 The situation is decidedly different today as a Southwold beach hut can set you back by as much as £120,000 – if, indeed, you’re lucky enough to find someone to sell to you. They seem to be handed down through generations of families and so it can be almost impossible to find one for sale. Now, assuming you have just spent an enormous amount of money buying such a hut what on earth do you use it for? They must be useful for something other than changing into your togs (ie swimsuit) I ask myself as I gaze at the brightly coloured cheerful-looking row of small buildings in front of me on the foreshore. The icy blast that arrived on cue and almost knocked me over reminded me that maybe nobody swims here much; it is, after all, a trifle different from Mooloolaba where I swim back home where, in winter, the temperature is hard-pressed to fall below 18˚ in the day. So, what do they use them for? A rather small, slightly scruffy looking beach hut that obviously needs some TLC went on the market recently for a staggering £60,000. 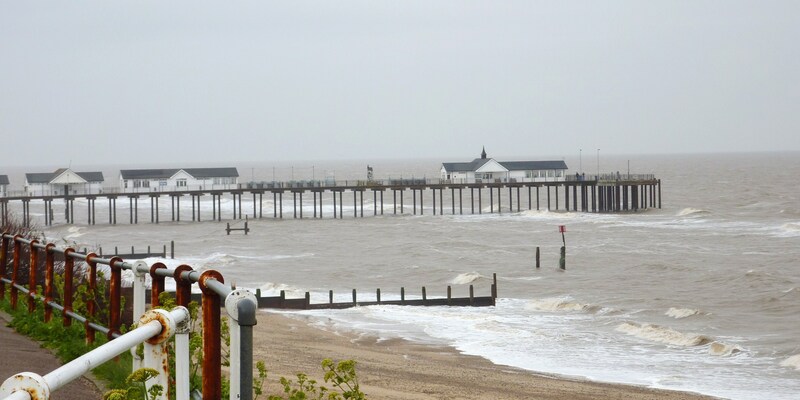 It’s main claim to fame was that it’s thought to have been on the beach (well, they’re not actually on the beach – more accurately they’re on the seafront) at Southwold for over 100 years and perhaps is the only original one left. Still it seems a lot of money to pay for a small, maintenance-challenged room which is 7 feet square (ie 2.1 metres square) and has no electricity, gas or mains water. To add insult to injury is the local by-law which stipulates that you can’t spend the night in it. Again, I ask, what do you do in it then? Have a cuppa protected from the wind….but only if you close the door so that you then can’t see the view? Argue about who gets to sit down comfortably because the hut’s so small it won’t fit enough chairs? Maybe it’s one of those questions that can only be answered once you’re in the situation yourself. I shall drop the subject lest anyone begins to harbour the notion that I have a rather lack-lustre imagination. Perhaps the average sale price of £100,000 is due to the close proximity of firstly, the North Atlantic Ocean secondly, a sandy beach, and thirdly, the ‘award-winning’ pier. The ocean was certainly a dramatic sight the day we visited with the water an ominous browny-grey and spray drifting onto us a lot even though the waves didn’t seem very big. I think it more an indication of just how fierce the blasted wind was that particular day. A sandy beach is rather special in this neck of the woods but, try as I might, I couldn’t help comparing it to Mooloolaba Beach. There’s no doubt though that a sandy beach beats a pebble beach any day. This is the same beach, presumably, onto which many bodies were washed after the Battle of Sole Bay in 1672 – an indecisive but bloody naval encounter memorable for the fact that the English and French fought together against the Dutch. The pier is privately owned and kept in great shape by the family who runs it. There are some beautiful photos of the area on the internet all of which have been taken on spectacularly sunny days and they show the blue of the ocean, the gold of the sand, the brightly coloured huts and the spick-and-span pier to perfection. In fact, seeing the huts like that, made me wish I had the odd £100,000 to spare to buy one! This entry was posted in Uncategorized and tagged camper van, southwold lighthouse, travel, vacation. Bookmark the permalink. Love your photos!! And yes, every day I am thankful for digital!!! Glad you like them. Have been checking out your interesting site. I feel mine is a little pedestrian by comparison! And here I was thinking that I had to run to catch up with you….I can almost smell the ocean and feel the wind on my face. Glad we connected…. Me too. I like the idea of having a blog for each separate topic. Will get my head around that sometime in the future I guess.